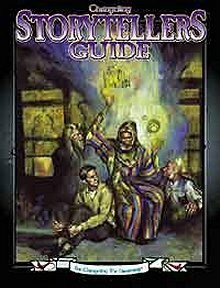 An invaluable resource for any Storyteller (GM). Publisher's blurb: "Changeling: The Dreaming is the game of faeries, hidden magic, strange realms and imagination, all set in the modern world. Thats a lot of stuff a lot more than we could ever hope to fit into one rulebook. The Changeling Storyteller's Guide therefore fulfills every gaming groups dream no pun intended. It picks up where the Changeling rulebook leaves off and offers a plethora of new information, from rules clarifications to new and advanced systems for handling fae magic and it puts that, and more, all in the Storytellers hands. Not only does The Storytellers Guide answer rules questions, it offers entirely new ways to play the game. Included are new settings and new rules for expanding the boundaries of your Changeling chronicle. This book is the one that every Changeling Storyteller needs."